← Episode 019 – Kill the worms! This example would kill any and all xterm processes with the default SIGTERM signal. Use of this command can be dangerous as it will kill all instances of the listed process unless you specify some limitations. But even then, be careful with this command. The above examples all do the same thing, terminate xterm with the SIGTERM signal. If three instances of xterm are running. Searching bash with the -l only shows “bash”. But using the -a shows instances where bash was called with “/bin/bash” along with just “bash” so you get the full command line that executed the process. This will also include switches but may not include pipes, redirects, or scripts passed to the command. Because the T has been capitalized, Terminal would be returned but not xterm, aterm, eterm, etc. 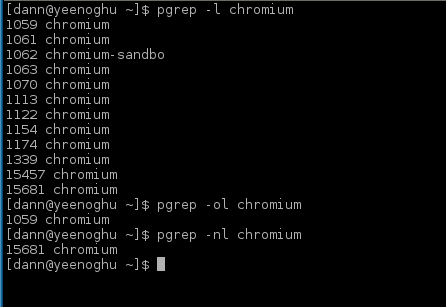 The -f switch matched on “chormium” in the command path whereas the first two examples only matched on the process name itself. This produces a list of all pids that are not the xterm process. Like -u, -U can take either user name or user id. The next few switches are handy if you want to find out what processes are grouped or attached the other processes. The -s, or –session, switch and pass the session id. This will display all processes in a given session id. You can find session ids using the top or ps commands. All processes in session 772 will be displayed. Note that you must pass the Parent PID, you cannot use the process name. You can find process groups using the top or ps command. This will list all the processes running on terminal tty1 and their PIDs. You can easily find what terminals are being used with the top or ps commands. 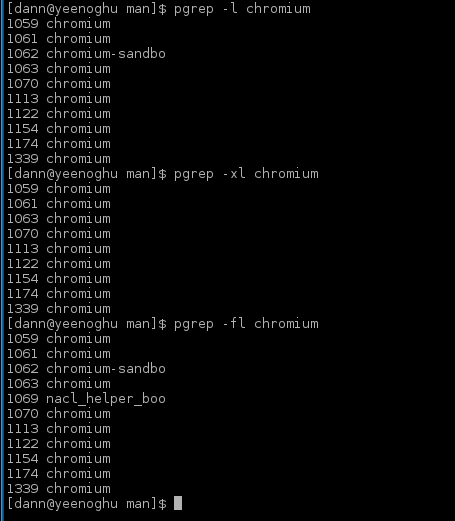 Notice that the first PID for chromium is 1059 and the last is 15861 and the output of the pgrep command using the -o or -n switches are those PIDs respectively. In the first example the delimeter is a “:” with a space before and after the “:”. The second example has the “:” as the delimeter but instead of a space uses double quotes on either side of the “:”. The third example uses the backslash escape instead of encasing the double quotes in single quotes to produce the same delimeter as the second example. It only lists the total of the xterm PIDs which in this case is 4. Normally pkill would not return any response if the command was successful. Should you attempt to run this to terminate a process that does not exist you would not receive an error message. Nor would you receive normally receive an error message or an indication that the process did not exist if you ran the pkill without the -e switch. Will only result in process 1025 being sent the signal. The remaining PIDs will not be sent the signal. This episode of Linux in the Shell focused on the pgrep and pkill commands. The pgrep command is a very quick and handy way to identify the process id’s for processes that are running on your system. The pkill command, while not as flexible as the kill command in some ways, allows you to easily kill processes by name as opposed to requiring the process id or supplying the full path to the the kill command to be able to kill a process by name. 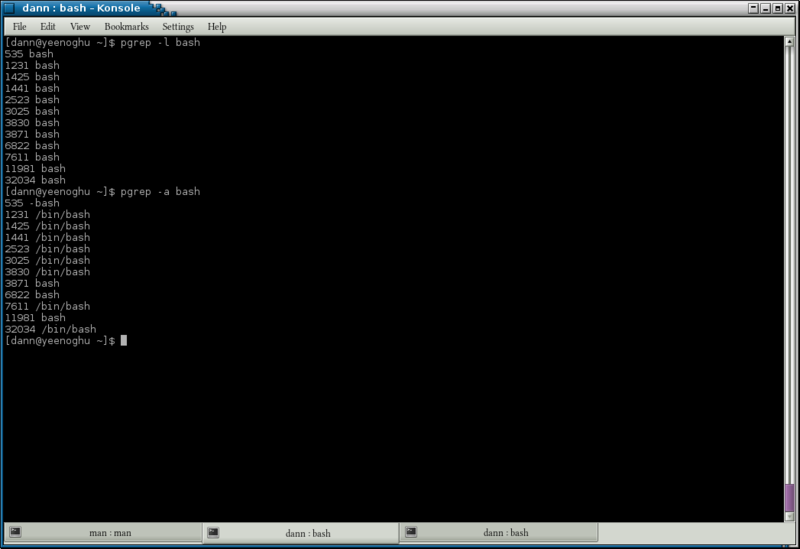 The -a switch does not exist in the Debian or Fedora version of pgrep on my machines. Very useful command though. Thanks. You are correct, this must be a fairly new addition. I see it in Arch but not Slackware, Debian, or Centos right now. But sometimes pkill command kills entire process tree, but sometimes it doesnt work. Some of the child process still be running in background. Is there anything wrong in my logic? ?